[May 11, 2012]–Here are some highlights from my new book Making the Masters: Bobby Jones and the Birth of America’s Greatest Golf Tournament (Skyhorse Publishing), based on extensive research of the newspapers and periodicals of the day and the writings of those involved. Part 1 gives some background on the site that became Augusta National. The land that ultimately became Augusta National was a tree and plant nursery called Fruitland from 1858 to 1925. The interesting thing is just how big and influential that nursery—owned and operated by the Berckmans family—was. It introduced to the U.S. many European plants, including a privet hedge that is considered the mother of all privet hedges in the South and most of the varieties of peaches now grown in Georgia (the Peach State). The Fruitland Nursery catalog was sent to customers all around the world, and Prosper Berckmans—son of a European baron who emigrated to the U.S.—was one of the great horticulturists of his day and the founder of the Georgia Horticultural Society. The site was almost used for a large resort hotel before it became Augusta National. This is fairly well known, but my research uncovered that an oft-told tale about why the hotel wasn’t built isn’t true. The story goes that a hurricane hitting Miami in September of 1926 stopped the Augusta project because damage to his flagship Miami hotel bankrupted developer J. Perry Stoltz. This didn’t really add up, because ground was broken for the Augusta hotel in February of 1926, and then nothing else happened even though the planned 14-story hotel was supposed to be built quickly and completed by January of 1927—so it should have been well underway in September. I found the smoking gun in a tiny legal notice in a June issue of the Augusta Chronicle, summoning Stoltz to court. He was being sued by the landowner, a development company, for failing to build a hotel as contracted. The Chronicle, incidentally, after splashing Stoltz’s plans all over the front page when they were announced, gave not a single word of editorial coverage to Stoltz backing out. But we can make a good guess as to why he didn’t fulfill his promises. He also had plans to build identical 14-story hotels in Chattanooga, Tennessee, and Hendersonville, North Carolina, and must have been overextended. So, hubris, not a hurricane, brought the project down. It’s a good thing for golf that the project didn’t go through. Stoltz was planning to let the engineer for construction of the hotel also design the accompanying golf course, so the result would have been nothing like the masterpiece that is Augusta National. 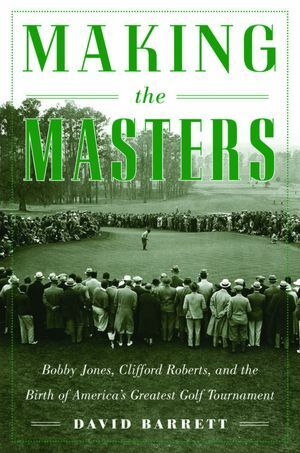 Going back earlier, a schism in the Berckmans family also may have contributed to the site eventually becoming available for Bobby Jones and Clifford Roberts to found Augusta National. Prosper Berckmans, who died in 1910, divided the property in his will, the southern portion going to his three sons and the northern part to his younger second wife, who was not the mother of the other heirs. This gave his widow the manor house that now serves as Augusta National’s clubhouse. The sons weren’t happy with this, and they started proceedings to contest the will. They later withdrew that action, but their displeasure led them to turn their attention away from Fruitland and Augusta. They bought a peach orchard about 60 miles away and concentrated their efforts there, selling the Augusta nursery business in 1919 to be operated by someone else but maintaining ownership of the property. Thus, they were open to selling the property to Washington Heights Development in 1925 when it was looking for a site for Stoltz to build his hotel, and Prosper’s widow was also willing to sell her part—thus the two halves of the property were reunited. When the Depression hit, it looked like Washington Heights Development was going to be stuck with a property it would be unable to either develop or sell. The Chronicle had tried to boost a plan in the spring of 1929 to raise $500,000 through the sale of local stock and out-of-town bonds to fund a hotel on the site. That probably wasn’t realistic anyway, and when the bottom of the economy dropped out that fall it became pie-in-the-sky. So, the company was lucky that Jones retired in 1930 with the dream of starting a golf club, a dream Roberts set out to help him fulfill. Roberts and Jones settled on Augusta as the preferred site because at the time it was a winter destination for well-to-do Northeasterners who could form the core of a national membership. Thomas Barrett, a prominent Augustan who would be mayor in a couple of years, showed Jones and Roberts the property in late 1930 and they instantly recognized that this was the place. Washington Heights wasn’t too lucky, though. They sold the property for perhaps a third of what they bought it for. Some other real estate investors fared much worse. The announcement of Stoltz’s planned hotel had quickly led to a land boom along soon-to-be-paved Washington Road. Locals enticed by real estate ads in the Chronicle (“May Be Sold Today to SOMEBODY ELSE if YOU WAIT” trumpeted one) and out-of-state speculators ran up prices in anticipation of development of the then sparsely populated area four miles from downtown. In 1929, the Chronicle reported that $1.25 million had been invested in the area and that the total property value had plunged to 25 percent of that amount. The birth of Augusta National didn’t help the value of those surrounding properties. The investors did OK only if they were able to hold out for three decades or so. By the 1950s Augusta had expanded along Washington Road, the main westward route out of town, to Augusta National and beyond, leading to commercial development on the main road and housing development around it. The Chronicle reported on plans for a new clubhouse, but the club never came up with the money to build it and refurbished the old one instead—a wise decision forced by necessity. In an indirect way, the Berckmans had a hand in designing the Augusta National course. When Jones first saw the property, he later wrote, not only did he think it looked like the land had been lying in wait for a golf course, “Indeed, it even looked as though it were already a golf course.” Jones and Alister MacKenzie put their fairways into corridors between trees that had already been cleared for plantings by Fruitland. Hardly any large trees needed to be removed. An aerial photo taken in 1930 before Jones, Roberts, and company purchased the land—possibly the one used by Alister MacKenzie when he made a tentative layout before visiting the property—could very well be mistaken for a photo of the course under construction. A nice touch at the start of Augusta National was the return of two of the Berckmans brothers who had grown up living on the property and spent so many years running the nursery. They had maintained homes in Augusta all along, and returned to business there when they opened a landscape design firm in 1929. Louis Berckmans, who at the time was doing the landscaping for Rockefeller Center in New York City, joined Augusta National as a member when it was formed in 1932. It was he who decided which plants would represent each of the 18 holes. P.J.A. Jr. (known as Allie) became the first general manager, and when the course was opened became essentially its first superintendent. They were 74 and 65 years old when the club started, and lived out their final years involved in an exciting new venture on what had once been the family property.